Sling Media released a major upgrade for its SlingPlayer app on Monday, adding AirPlay and Roku support and creating a stronger “second-screen” experience for users of its place-shifting video devices. Version 3.0 of the SlingPlayer iOS app is a major upgrade that runs only on iOS 7. It’s got AirPlay support, so iPhone and iPad users can send video streamed from a Slingbox attached to a remote device to an Apple TV. The only limitation is that, unlike video streaming from many other iOS apps, the Slingbox app will only stream via AirPlay as long as it’s the currently active app. If you want to check your email or Twitter while you’re iPad’s streaming to your TV, the connection will drop. There’s also a new SlingPlayer app for Android, and while it doesn’t work with Apple’s AirPlay, it joins the iOS version in being able to connect to Sling’s new Roku channel. The Roku channel enables AirPlay-like functionality for the Roku set-top box, allowing a SlingPlayer app to relay video to the Roku box for display on a TV. The net result is, if you’ve got an Apple TV or Roku, you can now use them to display the contents of a far-off Slingbox. SlingPlayer 3.0 adds improved navigation features and "second-screen" social and sports features. The other major addition to SlingPlayer 3.0 is a host of “second-screen” features that make it easier to find what’s on TV or call up additional information while video continues to play in a smaller window. There’s an extensive content discovery section where you can sort and filter based on different genres. For example, you might want to see if there’s a good movie on right now. You can search through currently airing movies and once you find it, tap to change the channel and begin watching. (Sling’s servers know the entire channel lineup for the cable or satellite service that’s connected to the remote Slingbox.) Tuning to a sporting event is similarly easy. When you’re watching something, SlingPlayer 3.0 gives you the option of layering on additional information. You can watch the show in a smaller window while viewing social-media posts about the program or pulling up stats for live sporting events. The SlingPlayer app for iOS and Android are available as of Monday; as is support for the Roku 3, Roku 2 XS, and Roku 2 XD. Support for Roku 2, Roku 1, and Roku LT is coming “in the next week,” according to Sling. 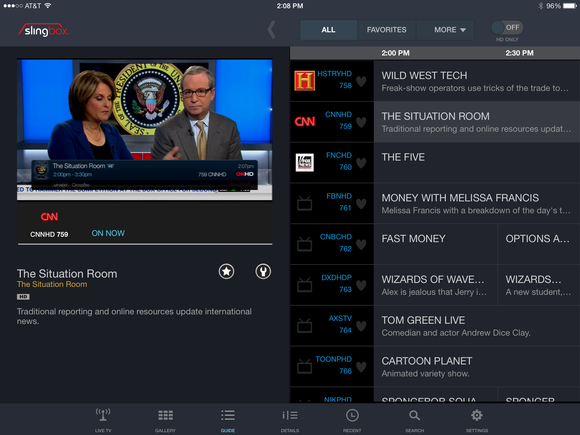 This story, "Slingbox gets AirPlay, Roku support and second-screen features" was originally published by TechHive.